The last game before Christmas saw manager Derek Thompson revert to a 4-4-2 with James, Fulcher and Holland replacing Williams, Johnson and Robinson. The loss of leading scorer Robinson was a massive blow as Blackett was also still missing meaning reliance on Yates and Jones up front. Right Back Ali Stoddart was making his 100th Northern League Appearance for the club. The visitors, in relegation trouble but buoyant from a win at Crook last week, included Dan Pigg and Chris Tarn who have 21 league goals between them this season. The pitch, which had caused the last 2 games to be postponed, looked heavy and started to cut up from kick off. The Stan were first to get going and forced the game’s first corner on 5 minutes and the veteran Yates was soon in the thick of the action when heading straight at the keeper on 10 minutes and then hitting the keeper’s legs a minute later when through 1 on 1. 2 minutes later he released Jones in the box and who calmly side footed across the keeper and in at the far post. The roles were reversed a minute later with Yates finishing neatly from close range after being set up by Jones. The Stan were rampant now and both forwards had other chances before Holland raced through but lifted his shot over the keeper and crossbar. RA almost punished this miss on 33 minutes when Pigg flicked a superb header off the inside angle of the post and bar and Smith was quick to divert the rebound off the line. The Stan finished the half on the offensive with Deagle having a free kick saved and Jones having a shot blocked and cleared and then shooting wide. 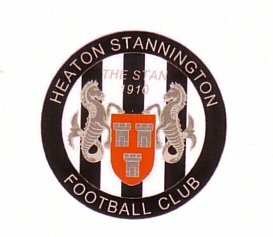 The Stan replaced Errington with Doyle at half time and were quickly back on the attack with Deagle breaking from half way and flashing an effort across the face of goal. The Stan midfield was totally dominant and a 3rd goal finally arrived on 58 minutes when a great cross from Holland found Yates and although he was crowded out Deagle kept the move going and Jones finished from close range. Wear then had a good chance but his effort from a corner was wide. It was substitute Johnson who made it 4-0 on 70 minutes when he volleyed home a rebound after the keeper had saved from Jones. It was now one way traffic as the RA defence tired and Yates headed home a Jones corner unchallenged on 78 minutes. Another corner saw Wear head just wide, but in 82 minutes Shane Jones completed his 1st Stan hat-trick when he tapped home after a good build up down the left ended with a fine run and cross from Lee Johnson. There was more misery for RA as firstly they had a consolation goal ruled out for offside and then Deagle took advantage of space down the left as he ran through unchallenged and finished from inside the box in the 87th minute. There was only one last wish on the Stan Army’s Christmas list and the Legend Gary Yates didn’t disappoint as he bulleted home a header from Jones’ superb free kick to get his hat-trick in stoppage time. He still had time to hook an easier chance over the top. The crowd of 117 had been given a festive treat as the Stan hit 8 goals for the first time since their return to the Northern League. Team 4-4-2 :Smith, Stoddart, James (O’Brien 67), Wear (C), Errington (Doyle 45), Fulcher (Johnson 64), Holland, Imray, Deagle, Yates, Jones.